Librarian, Editor, Secretary, Curator, and, finally, Chief Curator, Noe served the Society in many capacities in a career that spanned almost four decades. Sydney P. Noe was born on April 4, 1885 in Woodbridge, New Jersey. He graduated from Rutgers University, where he received his master's degree, in 1913. Two years later, in 1915, he joined the ANS as Librarian, where he reorganized the library's collection and created its photofile. Noe remained librarian until 1938, when he succeeded Howland Wood as Curator. Noe also served as Secretary for the ANS from 1917 until 1947, when he was named Chief Curator — the first person to hold that position. Upon his retirement in 1953, Noe was named Chief Curator Emeritus. During this period, Noe also served the ANS as Editor from 1921 to 1945. 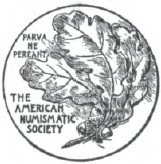 While Noe served as its editor, the ANS launched two of its most significant series, Numismatic Notes and Monographs, the first volume of which was his Coin Hoards, and Numismatic Studies. Noe's interest in numismatics did not stem directly from his education. His major at Rutgers was engineering. It was while Noe was working part-time in that school's library that he was assigned the task of classifying a gift collection of coins and his fascination with numismatics began. Noe was a specialist in Greek coins, but also studied the colonial coins of Massachusetts and the hacienda tokens of Mexico. 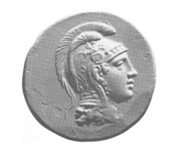 He authored more than 40 monographs and articles, mainly in the field of Greek numismatics. His published works, in addition to Coins Hoards, included A Bibliography of Greek Coin Hoards, The Pine Tree Coinages of Massachusetts, and Coinage of Caulonia. Noe was named a life fellow of the ANS in 1919 and a patron in 1968. Noe received the ANS's Archer M. Huntington Medal Award (1938), as well as the Medal of the Royal Numismatic Society (1949). Upon his retirement in 1953, Noe continued to come to the ANS several days a week. In 1965, the ANS Council presented Noe with a gold medal to commemorate his half century of service to the Society. Noe died in 1969 at the age of 84. April 04, 1885: Born, Woodbridge (N.J.). 1913: Graduated from Rutgers University, Township of Piscataway (N.J.). 1915 - 1938: librarians, American Numismatic Society (N.Y.). 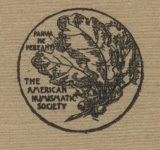 1921 - 1945: editors (assembling, revising), American Numismatic Society (N.Y.). 1953: Name Chief Curator Emeritus of the ANS, New York (N.Y.). Correspondence along with a notebook, identification cards, term reports, and other documents dating from Noe’s time as a student and assistant librarian at Rutgers and from several years after he graduated, along with clippings of his articles, a draft of his thesis, and photographs, notes and other material relating to his published work on Massachusetts colonial coins. Noe served the ANS as librarian, secretary, and curator. Correspondence and inventories relating to Schroeder’s efforts to gather and document his collections of porcelain coins, medals, and tokens. Correspondence with fellow coin collectors, coin dealers, friends, family members, and numismatic groups, and notes on coin sales. Image shows Sydney Noe in front of the Society's Audubon Terrace headquarters building in 1947, shortly after being named Chief Curator. Material related to research, identification and documentation of the Purple Heart Badge of Military Merit of the Order of Military Merit given to Elijah Churchill. Two scrapbooks containing correspondence and other materials relating to a hoard of silver coins (larins) found in Gampola Ceylon (Sri Lanka) that came to be owned by Wood.